The Atomic Weapons Establishment (AWE) is responsible for the design, manufacture and support of warheads for the United Kingdom's nuclear deterrent. It is the successor of the Atomic Weapons Research Establishment (AWRE), and has its main site on the former RAF Aldermaston. The establishment is the final destination for the Campaign for Nuclear Disarmament's annual march from Trafalgar Square, London. The first Aldermaston March was conceived by the Direct Action Committee and took place in 1958. There is currently a monthly women's peace camp held outside the Establishment to protest against its existence. AWE has become the target of a campaign, Action AWE of protest specifically aimed curtailing its production at the next UK elections. AWE plc is responsible for the day-to-day operations of AWE, and is owned by a consortium of Jacobs Engineering Group, Lockheed Martin UK, and Serco through AWE Management Ltd who hold a 25‑year contract (until March 2025) to operate AWE. All AWE sites remain owned by the UK government who also hold a golden share in AWE plc. 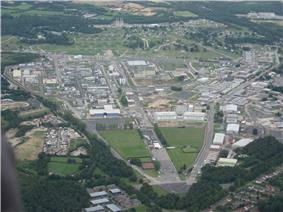 The company is based close to Aldermaston, with major facilities at Burghfield. The Atomic Weapons Research Establishment (AWRE) was established on 1 April 1950, by the Ministry of Supply, at the former RAF Aldermaston airfield. The airfield was constructed in World War II and had been used by the Royal Air Force and the United States Army's Eighth and Ninth Air Force as a troop carrier (C‑47) group base, and was assigned USAAF station No 467. AWRE's first Director was William Penney. In 1954 AWRE was transferred to the newly created United Kingdom Atomic Energy Authority (UKAEA). In 1971 the production activities of UKAEA were transferred to the newly created British Nuclear Fuels Ltd. (BNFL). In 1973 AWRE was transferred to the Procurement Executive of the Ministry of Defence. Parts of AWRE's weapons production processes were carried out at two Royal Ordnance Factories (ROFs): ROF Burghfield and ROF Cardiff. In 1984 these two ROFs were separated from the other ROFs; which were then formed into a government-owned defence company, Royal Ordnance plc and was privatised in 1987. ROF Burghfield and ROF Cardiff remained within the Procurement Executive and came under the control of AWRE. In 1987, AWRE was combined with ROF Burghfield and ROF Cardiff to form the Atomic Weapons Establishment (AWE). These sites being renamed AWE Burghfield and AWE Cardiff (the latter was closed in 1997). It remained with the Ministry of Defence, Procurement Executive. However, in 1989, the UK government announced its intention to find a suitable private company to run AWE under a Government Owned/Contractor Operated (GO‑CO) arrangement. In 1993 the government awarded a contract to Hunting-BRAE, a consortium of Hunting Engineering, Brown and Root and AEA Technology. During Hunting-BRAE's management AWE decommissioned the RAFs WE177 freefall nuclear bomb. In 1998 the company suffered two prosecutions for safety breaches, one for discharge of tritium into a nearby stream and another for an incident where two workers inhaled plutonium. In 1999 Hunting-BRAE lost the contract to AWE Management Ltd (AWE ML), a consortium of BNFL, Lockheed Martin and Serco. AWE ML's subsidiary, AWE plc, assumed responsibility for the operation of all AWE sites on 1 April 2000. This was not full privatisation as the Ministry of Defence continued to own all the AWE sites as well as a golden share in AWE plc. Critics pointed out that BNFL and Lockheed Martin did not have perfect safety records either. BNFL suffered embarrassing revelations of falsified quality checks in nuclear fuels and Lockheed was the subject of scathing reports on the operation of US nuclear facilities. Lockheed's failings included safety concerns at the Y-12 facility at Oak Ridge, Tennessee, an American weapons plant similar in certain ways to Aldermaston. In December 2008, the BNFL share in AWE Management Ltd was sold to Jacobs Engineering Group, an American engineering services company. To maintain the warheads for the Trident nuclear deterrent safely and reliably in service. To maintain a capability to design a new weapon, should it ever be required. To complete the dismantling and disposal of redundant warheads replaced by Trident. AWE cooperates with the Los Alamos National Laboratory in the United States and other American nuclear weapons laboratories in carrying out subcritical nuclear tests at the Nevada underground test site to obtain scientific data to maintain the safety and reliability of nuclear weapons. Subcritical tests are not banned by the Comprehensive Test Ban Treaty on nuclear weapons. The most recent test took place in February 2006. The cost of decommissioning AWE facilities when they become redundant, including nuclear waste disposal, was estimated at £3.4 billion in 2005. On 3 August 2010 a fire broke out in the explosives processing area at AWE Aldermaston, resulting in the evacuation of nearby residents from their homes. Investigations by a local newspaper revealed that from 1 April 2000, to 5 August 2011, 158 fires broke out at AWE sites, with the fire brigade being called out to deal with alarms on average four times a week over this period. The Health and Safety Executive took the decision to prosecute AWE plc on three charges relating to health and safety after their investigation into the fire in 2010, the first hearing in this case was held on 6 August 2012, the anniversary of the Hiroshima nuclear bomb. On 16 May 2013 AWE pleaded guilty to a single offence contrary to the Health and Safety at Work Act 1974. Formerly part of the Ministry of Defence, AWE Blacknest has, for over 40 years, specialised in forensic seismology, researching techniques to distinguish the seismic signals generated by underground nuclear explosions from those generated by earthquakes. It is approximately 1 mile west of the main AWE site. Blacknest's main function is to develop and maintain expertise in using seismic techniques to detect and identify underground explosions. This expertise and the techniques have been used in the past to provide assessments for the UK government on nuclear explosions carried out by other countries. The expertise is to be used as part of Britain's contribution to the Comprehensive Nuclear-Test-Ban Treaty which was signed in 1996, but which, as of 2015, has not come into force. ^ …. ', acting to halt nuclear weapons production at the Atomic Weapons Establishment factories at Aldermaston and Burghfield'…. Action AWE (28 June 2013). Retrieved on 17 July 2013. ^ http://www.1and1.co.uk/?kwk=2933855. Cndyorks.gn.apc.org. Retrieved on 17 July 2013. ^ No Nukes Inforesource: Site. Ecology.at (15 December 1997). Retrieved on 17 July 2013. ^ MarketWatch.com. MarketWatch.com (18 October 2011). Retrieved on 17 July 2013. ^ House of Commons Hansard Written Answers for 24 July 2006 (pt 1868). Publications.parliament.uk. Retrieved on 17 July 2013. ^ "Fire in Bunker at Atomic Weapons Site in Aldermaston". BBC News England. 4 August 2010. ^ Average of four fire calls a week at AWE (From Basingstoke Gazette). Basingstokegazette.co.uk. Retrieved on 17 July 2013. ^ Regional News Network – Press Releases – OPERATOR TO BE PROSECUTED OVER AWE SITE FIRE -OPERATIONAL NOTE. Rnn.cabinetoffice.gov.uk (15 June 2012). Retrieved on 17 July 2013. ^ Latest News > 16 MAY 2013 – AWE STATEMENT FOLLOWING READING CROWN COURT APPEARANCE. AWE. Retrieved on 17 July 2013. Arnold, Lorna (2001). Britain and the H-bomb. Basingstoke: Palgrave Macmillan. ISBN 0-333-94742-8. Freeman, Roger A. (1994). UK Airfields of the Ninth: Then and Now. Old Harlow: After the Battle. ISBN 0-900913-80-0. [Margaret Gowing|Gowing, Margaret]] and Arnold, Lorna (1974). Independence and Deterrence: Britain and Atomic Energy, 1945–1952. Volume 1: Policy Making. London: The Macmillan Press. ISBN 0-333-15781-8. Gowing, Margaret and Arnold, Lorna (1974). Independence and Deterrence: Britain and Atomic Energy, 1945–1952. Volume 2: Policy Execution. London: The Macmillan Press. ISBN 0-333-16695-7.